by Dow Smith, NACDB Member & Owner Dow Smith Company, Inc.
1. How much will my project cost? This is typically the first question owners ask our team–and understandably so. Constructing a new building or renovating your current facility is a massive investment and one you hope accommodates both your present and future needs. While we would love to be able to give a quick answer to this question, unfortunately, there isn’t a simple one-size-fits-all answer. We are sometimes asked for a “cost per square foot” ballpark figure. As much as we would like to be able to provide that, it simply wouldn’t be accurate. Does the construction site pose drainage problems or issues getting access or utilities to the site? What materials will be used to construct the building? How many windows and doors will be required and what type? What will the interior finishes look like? Is this project fast-tracked or can we wait to begin construction? These are just some of the questions that will need to be answered before an accurate cost estimate can be determined. Every building is unique and we treat each job as a custom project. Our estimating and construction process begins with getting to know our clients, as well as their present and future business or church needs. We value the relationships we make with our clients, as this partnership allows us to better serve them and develop trust. Once we understand our client’s needs and requirements, the estimating process can begin. Each project starts with a thorough understanding of the schematic designs, often taking hours to fully comprehend the project scope. Our estimators and project managers calculate the project’s materials down to the exact number of bricks, blocks and rebar required. Cost analysis is completed on sitework, carpentry, masonry, roofing and drywall, all to pinpoint the exact cost of a project. Bids are then submitted to subcontractors and tradesmen who then send in proposals for their services. This stage requires immense attention to detail – and lots of phone calls and meetings. To avoid costly change orders, each subcontractor proposal is reviewed to ensure every aspect of the project is addressed and that estimated costs are accurate. Though our team has been constructing buildings in Middle Tennessee for more than 20 years, each site and each project can come with its own challenges. A building’s location, size, purpose, and features all contribute to the project’s overall costs. Although the estimating and pre-construction process can be time-consuming, we’re able to provide our clients with an accurate project cost without hidden fees. We’re an “open book” on actual costs and we consider it our job to help you navigate design costs and design decisions that directly impact construction costs. Our team believes in being forthright, prepared and accountable–so your project can be successful and we end the project with a handshake and a smile. As mentioned above, there are many factors that influence the cost of construction. Some are obvious: land acquisition, permits and construction costs. Then there are the future costs or life-cycle costs to consider: maintenance, repair, replacement—the cost of keeping the facility and its systems up and running. Many design decisions affect the life-cycle costs and we make sure our client’s have all the information they need to make informed choices. This can present a number of problems for the owner: Can the design be built for the budget and within the desired timeframe? If the project needs to go back to the drawing board, how much time will be lost? What if the architect and contractor disagree? How many contracts need to be managed? 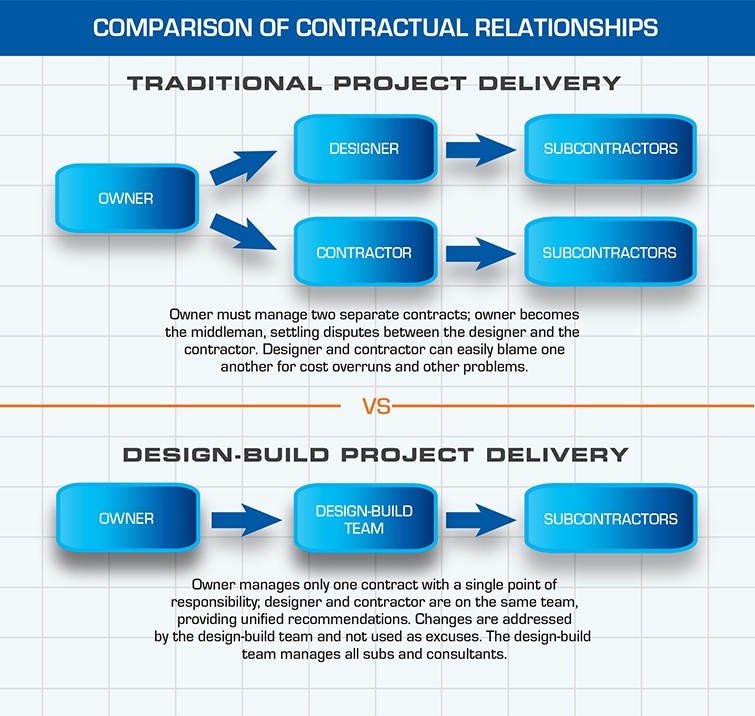 In contrast, the most effective way of achieving early contractor involvement is by employing the design-build project delivery method. Design-build streamlines project delivery through a single contract between the owner and the design-build team, creating an environment of collaboration and teamwork between the designers and construction team. 2. How long will it take to build my project? Many of the same factors that affect cost also determine your project’s timeline. Permitting, financing and weather also play a major role in deciding when you can occupy your new space. Our team understands that the sooner you can move into your new building, the sooner you can get back to business. In addition to spending hours to fully comprehend our clients’ projects, we also employ the design-build delivery system I described above to save even more time and money. Design-build construction’s cost efficiency, time savings, and collaborative nature have made it popular among clients for everything from commercial and municipal buildings to sports facilities, churches, restaurants, manufacturing plants, medical facilities, and more. The design-build process is much more fluid than traditional design-bid-build. Instead of long gaps of time (and remember, time is money) between different phases of a project being completed by different participants, each member of a design-build team works together from the start and during every step of the process to help move things along quickly and more smoothly. We have experienced that fewer design changes and mistakes are made due to miscommunication when design-build is employed. The increase in collaboration enables customization and innovation, which results in less time and fewer materials being wasted at each stage of the project. The result? A higher quality deliverable—with no surprises—ultimately resulting in increased satisfaction by the owner. Our team strives to maintain constant communication with our clients, allowing them to be informed about all aspects of their project. Our construction team meets daily to discuss project developments and construction progress. Our team’s communication doesn’t stop when the blueprints and conceptual drawings have been drawn up. We believe that it’s crucial not only for our team to start working on a project from the beginning, but also to have the same team members following through with construction to the end. Not only does this mean your project is under constant supervision, but it ensures issues are resolved before they happen, saving our clients time, money and headaches. After all, your time is important, too. 3. What will the completed product look like? An owner is typically trying to ensure that what they envision in their heads or scratched on their cocktail napkins will look the same (or better) when it’s built. We have a variety of tools that we use to help an owners visualize their completed projects before shovels even hit the ground. There has been a recent increase in the use of technology and software applications in construction, and we have seen the benefits first-hand. Our team utilizes Computer Aided Design (CAD) floor plans, elevations, conceptual drawings and 3D renderings that provide a photo-like image of your proposed building. Alternatively, we provide conceptual sketches of the project to help clients visualize what the project will look like once it is completed. Plans, schematics, elevations, renderings and other construction documents can also be stored and accessed in the cloud on secure servers, allowing our team and our subcontractors access in the field. Not only does design software help us complete drawings more efficiently, it can help us prevent costly and time-consuming change orders as each member of the construction team can view the most up-to-date project details. At the close-out of the project, we also provide owners with O&M manuals, as-built drawings and other resources they will need to operate their new facility. Our team takes immense pride in the work we do. We treat each client’s project as if it’s the only one we have. When construction is complete, you can be confident that your new building or renovation will serve you not just now, but for many years to come. As churches and religious organizations expand and grow, they can face obstacles and push back from municipalities. Common complaints from municipalities typically revolve around alleged parking or traffic concerns. However, these alleged concerns are sometimes merely a charade to prevent a tax-exempt religious organization from occupying an otherwise taxable piece of property. Although the law has been in effect for eighteen years, the Department of Justice has indicated that “far too many people and communities remain unware of the law, or do not fully understand the scope of its provisions.” In fact, a July 2016 report by the Department of Justice revealed that the number of RLUIPA investigations on a per year basis has remained pretty constant since the enactment of the law. A detailed Statement of the Department of Justice on the Land Use Provisions of RLUIPA with Questions and Answers (June 13, 2018), is available here. The DOJ also launched a new web page, which provides more information on RLUIPA and its protections. A church is denied a permit to build an addition to accommodate more Sunday school classes, which it believes it needs to carry out its religious mission. This may violate RLUIPA if the municipality cannot show a compelling reason for the denial. A church leases space in a storefront. Zoning officials deny an occupancy permit because houses of worship are forbidden in that particular zoning district. However, fraternal organizations, meeting halls, and banquet facilities are all permitted as of right in the same zoning district. This may violate RLUIPA. 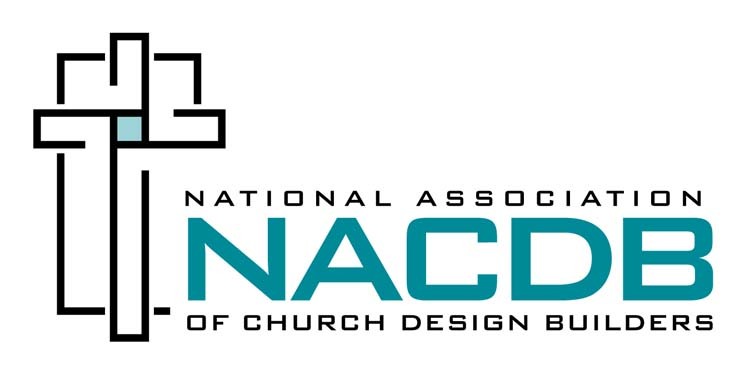 A Baptist congregation is denied a building permit for a church despite meeting all of the requirements for height, setback, and parking required by the zoning code. The zoning administrator is overheard making a disparaging remark about Baptists. If it were proven that the permit was denied because the applicants were Baptists, this would violate RLUIPA. A municipality, seeking to preserve tax revenues, enacts a law that no new churches or other houses of worship will be permitted. Such a total exclusion may violate RLUIPA.